₹300 for the post of Sportsmen (₹50/- for SC/ST/PWD candidates) and ₹600/- for other posts (₹100/- for SC/ST/PWD candidates) should be paid by directly online only. 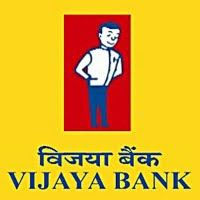 Apply Online at Vijaya Bank Website from 12/04/2018 to 27/04/2018 only. Printout of the system generated application format should be send on or before 04/05/2018 and 11/05/2018 for the candidates from far-flung areas.